A fascinating account of the true story behind the popular Good King, in this unique book. Our book is about Saint Wenceslaus who has many churches dedicated to him in USA and Canada. The churches in North America were established by Czech immigrants who brought with them their love and respect for Saint Wenceslaus. He is also known from the popular Christmas carol Good King Wenceslaus looked out….by John Mason Neale, believed to be written while he was a warden in Sackville College, built in 1608 as an alms house in East Grinstead, England, Great Britain. Sackville College is now open to visitors. There has been nothing like it published before in the English-speaking world. Early history of Bohemia and Christianity in Central Europe is covered by the book. Every visitor to Prague or Praha, as it’s known in the Czech Language, will find this book useful and interesting. Prague was the capital of Central Bohemia during Wenceslaus’s rule and is now the capital of the Czech Republic. Saint Wenceslaus is also known as Saint Wenceslas in the UK and as the book was published in England, the English spelling of his name prevails throughout the book. In the Czech Language he is known as ‘svaty Vaclav’. Archaeology finds and many legends tell us about the early days of the Slavonic people in Bohemia. Wenceslaus was born into the Premyslid dynasty of dukes, princes and kings which ruled Bohemia for almost a thousand years. Young Wenceslaus was greatly influenced by his grandmother Duchess Ludmila, who also became a Czech Saint. The arrival of Christianity from Moravia brought the first writing in the Slavonic language, known as ‘Hlaholice’ and also new customs and practices such as building with stone and mortar. Young Wenceslaus was educated in Slavonic reading and writing by Ludmila’s priest, Paul, who in turn has been educated by the Greek missionaries, Saint Cyril and Saint Methodius. Hlaholice was later developed into Cyrillic script by St Cyril’s pupils. In later years Christianity was also preached in Bohemia by priests from the West, using Latin and thus the first Latin school was established in a castle Budec, which was attended by young Wenceslaus. Excavations found sharp instruments called 'stiluses' with which pupils were writing on wax-covered plates. Wenceslaus lost his father at the age of thirteen and, as the oldest male, he was enthroned. However, his mother, Drahomira ruled until he was eighteen. Drahomira had Wenceslaus's grandmother, Duchess Ludmila, murdered and in many ways returned the country to a pagan way of life. Wenceslaus, once he came of age, made a firm return to the Christian way of life. He built the Rotunda of St. Vitus, a sophisticated construction for its time, in Prague Castle. Wenceslaus was trained in combat from an early age. He was not afraid to stand up to the neighbouring Duke Radslav. To save bloodshed on both sides, Wenceslaus challenged Radslav to a duel and won. 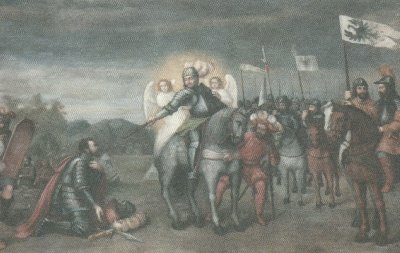 On the left is a picture from the Basilica of Saint Wenceslaus in Stara Boleslav, showing submission of Radslav to Wenceslaus after the duel. 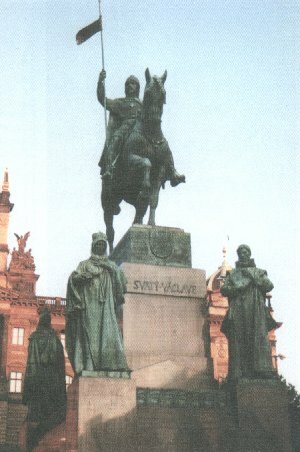 Not only churches were built dedicated to St. Wenceslaus but also statues were erected like the one shown on the right, which stands on Wenceslaus Square in Prague. There is a lot more to the story of Good King Wenceslaus (Wenceslas), which is revealed in the book you can now order online. The book is also available in the UK through local bookshops. One copy of Good King Wenceslas is £9.99 UK Sterling, and can be ordered securely via PayPal. The book is also available for purchase in the UK through local bookshops. Postage and packaging is £1.99 within the United Kingdom via Royal Mail, and £3.99 Internationally via Air Mail. Please send me copies of Good King Wenceslaus - The Real Story £9.99 UK pounds each + P&P per order. I would also like my book(s) signed by the author, Jan Rejzl. 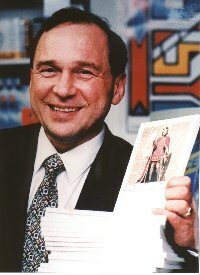 Jan Rejzl was born in 1948 in Stara Boleslav in then Czechoslovakia and was introduced to the story of Saint Wenceslaus at an early age in the local Basilica of Saint Wenceslaus where he was an altar boy from an early age and for many years. At the time of Jan’s schooling, the only second language available in schools was Russian. When Jan was in his teens he began private lessons in English and acquired penfriends in USA and Canada to practice his English. In 1968, during Dubcek's Prague Spring, Jan received an invitation through a family friend to go to Glasgow in Scotland for a summer holiday to learn English. After his parents paid for a train ticket from Prague to London, Jan was allowed to buy £2 from the Czechoslovak bank in Prague for his pocket money. He hitchhiked from London to Glasgow. After a week in Scotland Jan returned to London where he helped in the home of George Cansdale, who was once the director of London Zoo and a prominent person at a Central London Church of England church. Later he went to work on a farm in East Anglia when the Warsaw Pact countries invaded Czechoslovakia. After an extended period in England, at the request of his parents, Jan returned to Czechoslovakia in October 1968. On his return, Jan found that the spirit of the Prague Spring had disappeared beneath the pressure of the Soviet-led occupation. He managed to leave the country permanently for England in June of 1969. In England, Jan used to tell his friends that the story of Good King Wenceslaus was based on a real historical person and his friends suggested to him that he should write up the story and publish it. In October of 1988, after nearly twenty years in Britain, Jan returned to Czechoslovakia for a week's holiday with his small children Adam and Hana and started to research the history behind the story of St Wenceslaus, collecting books and visiting important sites. Jan visited Czechoslovakia regularly to continue his research and write this book before it was finally published in 1995.